Hello, Gorgeous! : tweed it to me! This month? TWEED. If it's tweed, I must have it. Did you know that last week I bought three (THREE!) tweed jackets in one day? Well, as in turns out, I like tweed on my top AND my bottom. Jackets, skirts, GIMME!! That white jacket is beyond beautiful! I think tweed is SO classic and girly! Great pieces! Tweed is so classic and feminine. That white jacket is gorgeous! I love your Forever 21 polka dot shirt!! It is just so cute. 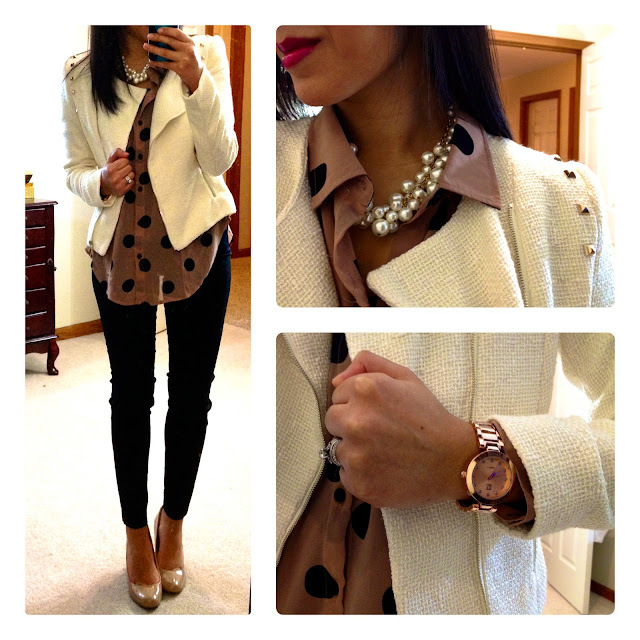 Love how you styled the skirt, and really love that pearl necklace. that white jacket is amazing! Oh I love that white jacket, i would definitely wear tweed if it always looked like that! I love both of these outfits! So cute!! I love the tweed in both!! SO classy! Love outfit #1 & totally just bought it online. :). I love so much this blog. Maybe we could follow each other on Bloglovin and/or GFC? Yasi, was the top see-through? I really like the top and with that price I placed it in my basket however going back to the model picture it seemed to be extremely see through so I passed on it but it doesn't look that way on you. Would you see yourself wearing the top without the tweed jacket over? Great picks of latest fashion clothes.. Fabulous..!! What size jacket did you order? life in pictures: our ski trip! ...let's get personal for a minute.